Reviewing the state of the war in Indochina at the end of Giap’s Winter-Spring Offensive (May 1953): recall that following a series of jungle battles at places like Na San, Muong Khoua and Sam Neua, French commander Raoul Salan believed the Vietminh would try again for Luang Prabang. And so he recommended establishing a base in the remote northwestern corner of Tonkin, along the access routes to Laos, at a remote post called Dien Bien Phu. Coincidentally, Vietminh General Vo Nguyen Giap scoped out his own thrust westward into Laos. Giap, by then a virtual master of logistics, had been reinforcing his armies with men and supplies and placing them strategically along the border in the highlands of Tonkin. In so doing, Giap’s troops could operate relatively safely to the west toward Laos. The French on the other hand saw their ability to supply troops in the Highlands and at remote border posts greatly reduced. Add in the great distance between those troops and French supply depots inside the Red River Delta, it is no surprise that the French were increasingly forced to rely on aerial resupply. French commanders ignored this seemingly obvious weakness in their strategy, until it was too late at Dien Bien Phu. Most observers of this particular event in history chalk it up to pure hubris on the part of the French. Whatever the reason, over-confidence or incompetence, the decision to establish a static base in a remote valley in enemy territory had tragic consequences for many. And glorious ones for others! A second snapshot of events and force deployments at that time, May 1953, reminds us that there was a newly opened (by the Vietminh) front in south central Vietnam, in the Central Highlands around Pleiku and Kontum. What we see when looking at the Winter-Spring campaign is a French command almost entirely reactive at each stage; from Nghia Lo to Sam Neua Giap consistently maintained the initiative and owned the element of surprise. General Salan conversely was stuck playing the role of the man who tries desperately to plug the cracks in an ever-weakening dam. He was forever shuttling his strategic reserve, particularly the elite parachute battalions and Foreign Legion battalions, from place to place to meet each new attack. That was the way things stood at the end of Salan’s tenure as French Commander. He was leaving on the heels of the disaster in April 1953 at Sam Neua, where the French ordered a retreat when it was too late to get the garrison out by air and lost almost everything, and one of his final actions was to recommend the taking of Dien Bien Phu in response. To follow Salan the French government appointed Lieutenant General Henri Navarre commander-in-chief of forces in Indochina. With public opinion about the war slipping badly in Paris, the increasingly desperate rulers were eager to find some spark to turn their fortunes in the colony. Navarre was given carte blanche and one of his first orders was for the delivery of an additional seven battalions of reinforcements from France. Plus he brought up to two other battalions with reinforcements, including the French Foreign Legion battalion that had fought with UN Forces in Korea– Le Regiment de Corée. As mentioned the French people were souring on the war. In fact, by then both sides were worn down by years of fighting, although the Vietminh were clearly gaining the upper-hand. By the end of the wet monsoon season in 1953 there was pressure for peace negotiations. Yes French war-weariness was a driving factor, but we can’t ignore that the Vietminh had problems as well. Vietminh armies were growing in numbers and were more far-flung, supply lines for rice and equipment were becoming strained. Domestic production could not keep up. The Korean War was winding down and the Americans had come in with big money on the French side. In response, the Soviets and the Mao’s China took a more active role in helping Ho Chi Minh make up the difference. They brought in food and heavy weapons and ammunition, but they were getting impatient too. With peace negotiations almost assured, a tacit consensus emerged among the French that there was time for one last game changing campaign. They would draw Giap into an epic set-piece battle in a well defended valley along the infiltration routes to Laos, the outcome of which would give the winner the advantage at the peace table. Navarre felt sure his forces would prevail. Giap of course knew otherwise, he would not be goaded into giving the French their elusive dream of a defining set-piece battle, instead he would lead his people’s army to victory using a combination of logistical magic, martial spirit and nationalistic yearnings. Henri Navarre, the new commander of forces in Indochina, had a fascinating record. Navarre enlisted in the French Army in 1915. After serving in the WWI trenches as an enlisted rifleman, he qualified for an appointment to St. Cyr in 1917. He received his commission in 1918, returned to the field, and saw distinguished combat service in the waning days of the war. Later he became the chief of the French Army’s intelligence section. He was in charge of evaluating the German Army from 1938 through 1940! Whatever the level of his culpability personally, that surely went badly. Nevertheless, Navarre became an active participant in the French Resistance during World War II. He narrowly escaped capture by the Gestapo on several occasions and showed considerable panache in doing it. He led troops in battle late in the war. He even commanded an armored battalion for our old friend Bernard de Lattre. Now Navarre was assigned another command role, this time his country’s fortunes in her colony hung in the balance. He was a decorated and resourceful soldier but he was severely handicapped by the fact that he had never served in the Far East. Navarre recognized his liability. At first he did not display any preconceived plan for recasting the military situation in his own image in Indochina. Instead, Navarre left Salan in charge for a week while he took an inspection tour of his troops around Indochina. During his first days in Indochina, and particularly during his tour of forces in the field, Navarre formed some judgments about the strategic situation and about certain personalities. One of his key decisions was to select General René Cogny as his principal subordinate, promoting him to major general and giving him command of all field forces in Tonkin. General René Cogny, had too been a member of the French Resistance in World War II. He though was captured by the Germans, and ended the war in Buchenwald concentration camp. The experience left him walking with a cane the rest of his life. After the war, Cogny went back to school, earning a double baccalaureate degree in law and political science from the elite École Polytechnique. He was a highly educated dynamic leader with a flair for the flamboyant. He had come to Indochina first in 1950 as a member of Marshal de Lattre’s staff and had since commanded a division in Tonkin. He believed the delta region, with its dense population and rice production, was the key to winning the war. He warned Navarre of the dangers of shifting troops from the Delta to action elsewhere. Yet, curiously, he also promoted the reoccupation of Dien Bien Phu as a “mooring point” for anti-Vietminh tribal guerrillas in the area. This inconsistency would come into full view in the feud that developed later between Navarre and Cogny over who was responsible for the debacle at Dien Bien Phu. The level of Cogny’s commitment to the strategy of using the hedgehog at Dien Bien Phu to take on the full force of a major attack by Giap’s army became a point of contention between the two men for years after. Cogny claimed he never enthusiastically backed the operation that would come to be called the Navarre Plan. Navarre as you might expect always held that Cogny was a strong advocate early on. When Navarre met Colonel Louis Bertil he was commanding Goupement Mobile 7, defending Na San, where the Vietminh had suffered a bloody repulse the previous December. The first phase of Giap’s ‘52-53 Winter Spring offensive had run out of steam at Na San, about 60 miles east southeast of Dien Bien Phu. Giap made a concerted effort to capture the fort, probably because he needed Na San for a logistical base. But the French reinforced Na San by air and successfully beat back three successive human wave attacks, smashing several of Giap’s regiments in the process. This was one of the last significant victories the French would enjoy in the war. Bertil saw Na San as a model for a new operational concept, a way to insert French forces into the middle of Vietminh territory, particularly along Vietminh lines of advance. He came to call it the “hedgehog” concept; seize a base area with airstrip capacity by airborne assault, and fly in forces and equipment to create a fortified airhead– called a hedgehog. It was thought that this strategy would lure Vietminh main force units into battle on terms advantageous to the French. By blocking Vietminh supply routes the French command gambled they could draw Giap out in the open and into a set-piece battle. If the Vietminh attacked the French base they’d be up against artillery, aircraft, and all the firepower the French could bring to bear in defense. Navarre and Bertil hit it off. When Navarre made his selection of staff officers and commanders, he picked Louis Bertil as his deputy chief of staff for operations. The “Hedgehog” concept was embedded in the command psyche. Navarre, now eager to take charge of the war, launched a series of clearing operations in the Red River Delta beginning in June, 1953. Then, in July, the new commander launched Operation HIRONDELLE, a bold airborne assault on Lang Son, which had grown into a major Vietminh logistical base since its capture in 1950. Mounted during a break in the monsoon rains, HIRONDELLE caught the Vietminh by surprise. French paras dropped in unopposed, wreaked havoc and fought their way east to the coast where they were evacuated by sea. Then, in late July, Navarre launched an ambitious clearing operation on the coast of central Annam, Operation CAMARGUE (named for the salt water marshes near Marseilles) along RC 1 between Hue and Quang Tri (AKA—La Rue Sans Joie, the Street Without Joy). Finally in mid-August, he ordered the Na San airhead evacuated, an operation the French pulled off. At this point the French were in decent shape. They were on the offensive and had regained some of the initiative. Then, Navarre ordered a major spoiling attack involving six mobile groups reinforced by tank units and two dinassauts into the base areas of the 320th Division south of the lower Day River. Code named MOUETTE (Seagull), the attack went off on 15 October. A clever ruse was used by the French—they led the Vietminh to believe they were planning an amphibious landing on the coast near Than Hoa—and they achieved surprise. Giap was caught off guard, but quickly recovered. Just as he had done on previous occasions he told two of the 320th’s infantry regiments to stay behind to cover the withdrawal of the rest of the division. They were to delay the French long enough to permit the evacuation of supply dumps. The French relented. By the 7th of November, they had disengaged and were back inside the Delta. In late October, with MOUETTE still in operation, Giap ordered the 316th Division to leave its base area in the Bac Viet and head toward Lai Chau near the Laotian border. French intelligence quickly learned of the 316th’s movements and destination. Upon receiving the news, Navarre ordered a six battalion parachute drop to occupy the Dien Bien Phu basin. It would go off in Mid November. 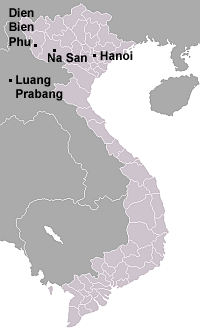 Whether or not he was explicitly ordered to defend Laos, Navarre was clearly aware of the political implications to French credibility if the Vietminh should seize Luang Prabang or the Plaine des Jarres. Re-enter the hedgehog concept of Colonel Bertil. If Navarre adopted the hedgehog concept he would have to seize and defend an air head astride the Vietminh advance routes into Laos. If he could pull it off he could not only thwart the Vietminh advance, he might also bring them to battle on terms favorable to the French. Resurrecting Cogny’s plan, the air head was to be a “mooring point” from which pro-French guerrillas could sortie forth into the Vietminh rear areas to raise hell. True to form, French command’s obsession with set-piece battles crept into the operational concept. The hedgehog, they hoped, might be that irresistible target against which the Vietminh would break their modus operandi and bring main force units out of the jungle for a slugfest. Navarre ordered Cogny to initiate Operation CASTOR, to seize the airhead at Dien Bien Phu and control the valley. While all this was happening France’s political leaders were making momentous decisions. On November 13 the French National Defense Committee met in Paris and with the consent of Prime Minister Joseph Laniel agreed to seek a negotiated settlement with Ho Chi Minh. Rear Admiral Cabanier, was sent to Saigon to so inform Navarre that he would receive no more reinforcements from France and instruct him on his next course of action. Subsequent events are controversial to this day; in order to prevent the results of their deliberations from appearing in the French press, the Committee ordered Cabanier to deliver the instructions verbally. There has been a controversy ever since over what was really said. Cabanier arrived in Saigon on the 19th of November, 1953, just as Operation CASTOR, the occupation of Dien Bien Phu by airborne assault, was launching. He would meet with General Navarre as the first French paras were floating down over Dien Bien Phu. Interestingly, the weather was questionable for jumping over western Tonkin that day. Cogny and the commander of the assault force, Brigadier General Jean Gilles, considered calling the operation off. The window of opportunity was a brief one, and it’s quite possible that had they opted out that day the operation would not have been re-mounted, ever. At any rate, they decided to go for it. If the French intended to deploy a large force to Dien Bien Phu and seek battle there, a number of problems had to be addressed, and in the final analysis responsibility for the solution was Cogny’s. First, the French would have to rely exclusively on air supply and Dien Bien Phu was a long way from French airbases in the Delta, nearly three times as far as Na San. 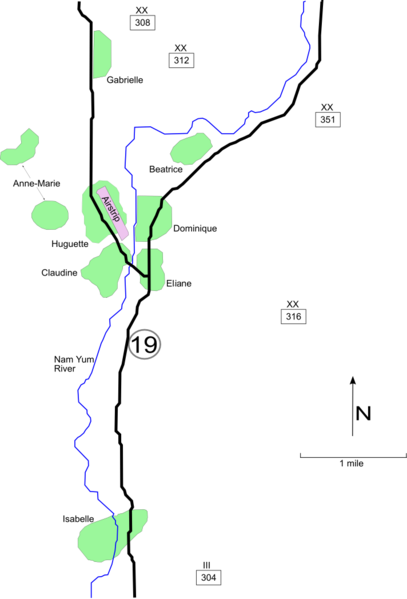 Second, the Dien Bien Phu Basin has the heaviest rainfall of any location in northern Indochina: on the average, five feet of rain between March and August. Third, should the surrounding T’ai villages fall to the Vietminh, Dien Bien Phu could be asked to accommodate a flood of refugees, and last, the base would occupy the low-ground in a valley ringed by mountains. Cogny would have to rely on artillery and foot patrols to control the high-ground. Not an ideal situation in pure military terms. And what must have Ho Chi Minh and General Giap thought when they learned that six parachute battalions had dropped on Dien Bien Phu? They must have quickly concluded that the French were mounting a major operation. But they also had to have seen the opportunity presented to them. By placing significant forces in the highlands of Tonkin, the French had reduced the threat to Giap’s base areas near the Delta, freeing up forces with which he could confront his enemy at Dien Bien Phu, invade Laos, or both. Giap responded quickly. Less than a week later, French intelligence intercepted radio messages indicating that the 308th and 312th Infantry Divisions and the 351th Heavy Division were preparing to depart their cantonments in the Viet Bac for the Dien Bien Phu basin. One intercepted message ordered the construction of bridges and ferries across the Black and Red Rivers by 3 December that would support the passage of 6,000 troops a night. In early December Giap decided to fight at Dien Bien Phu. By the end of January, the Vietminh had surrounded Dien Bien Phu. Navarre then made a curious decision; instead of evacuating or reinforcing Dien Bien Phu, he ordered a major operation in central Vietnam. Operation ATLANTE turned out to be an assault on the Street Without Joy four times larger than Operation CAMARGUE. Back in the summer, CAMARGUE had swept through exactly the same area with little to show for it. Some have suggested Navarre may have hoped that ATLANTE would draw Vietminh forces away from Dien Bien Phu. If so, he was mistaken. The distances were too great. And it wasn’t in Giap’s nature to be deflected from his primary objective, especially when he smelled blood in the tank. It wasn’t his style. With the exception of the 320th, which as usual stayed behind to guard base areas south of the Delta and the rice supply in Than Hoa, the Vietminh divisions continued to advance on to Dien Bien Phu. Probably the best assessment of Navarre’s motivation in launching ATLANTE is that he was looking to improve the French bargaining position in the upcoming peace negotiations that he thought would be breaking out soon. It is questionable whether he intended ATLANTE as a diversion. His own response to his critics in the aftermath of defeat was that the units used in ATLANTE would have been of little use at Dien Bien Phu. That assessment has also been controversial ever since. Back at Dien Bien Phu, the French operational concept was to seize the place from the air, then pull out the paras except for a battalion or two in reserve and replace them with regular, line infantry. Then they would drop in bulldozers, expand the airstrip, and fly in everything they needed to build and defend the base, notably artillery. The idea once again was to use the place as a “mooring point” to support raids into Vietminh territory. What kind of commander do you want to do that? A dashing cavalryman like Colonel Christian de la Croix de Castries of course. Christian de la Croix de Castries, was a distinguished soldier, like Navarre he was a cavalryman from a noble family. He began his military career as an enlisted man in 1915 and later received his commission. During the last days of World War II, he led armored units with great success. He had also compiled a distinguished combat record in Indochina leading his mobile group. He brought his French secretary, Madame Paule Bougeade, into Dien Bien Phu with him. She had accompanied him for years on campaign. French officers had certain privileges. De Castries’ principal subordinate was Lt. Col. Pierre Langlais, commander of the 2nd Airborne Battle Group, as the parachute units at Dien Bien Phu were collectively titled. Langlais was a consummate professional and highly experienced, a long-term para. He was morose and withdrawn personally and often was brutally frank with superiors and subordinates alike to the point of being insulting. As events unfolded during the battle he became the garrison’s de facto commander. Langlais’ chief subordinate was Major Marcel Bigeard, perhaps the most distinguished battalion commander in the French Expeditionary Force, commander of the 6th Colonial Parachute Battalion. We met him previously at his battalion’s sacrificial drop at Te Le Pass a year earlier. Bigeaard was one of those bigger than life characters who seemed to defy all odds when the chips were down, and he had an ego to match, but he was a master tactician and soldier, really good. He would be the counterattack commander at Dien Bien Phu. He was a master of coordinating close artillery support for rapidly moving ground troops. He never carried a weapon in combat; he carried a swagger stick and a battery of radios and that was all. At Dien Bien Phu the French artillery commander was one Lt. Col. Charles Piroth. Like many of his comrades, Piroth was a highly decorated veteran of World War II. He had lost an arm in Italy. He knew his craft and was outspoken about it. If you were a visiting dignitary at Dien Bien Phu in those early days before the siege you no doubt had a session with Piroth on your agenda. It was he who most outspokenly preached the gospel of superior French artillery and firepower. When arriving in the valley one of the first questions on the minds of many when seeing the proximity of the surrounding mountains was: what happens if the Vietminh put artillery up there? The French had occupied the low ground and left the mountain crests above open. Basic tactics tell us that is not sound military practice. But Piroth would discount those fears as overstated. He preached that the Vietminh didn’t have the ability to get large amounts of artillery up there, and if somehow they did, his guns would quickly target them and destroy them. A few test rounds would be fired for effect and that was that. Piroth liked to boast that even if he couldn’t destroy all the enemy guns, Giap could never bring enough ammunition into the valley to do the French serious damage. This turned out to be a serious miscalculation, with grave consequences for Piroth. Brigadier General Jean Dechaux, Commander of the northern tactical air group. Although not stationed at Dien Bien Phu he was entrusted with the enormous task of providing material support through the air for the hedgehog. He was tall and angular and stubborn. Dechaux is reported to have been tough on his subordinates. He went on record as opposing the campaign from the start due to the logistical problems associated with supplying the base. This was not a good start for the French at Dien Bien Phu. Even though his generals were carrying out General Navarre’s orders despite their misgivings, it was hardly a confidence inspiring atmosphere in which to launch an operation that could well decide the outcome of the war. On the Vietminh side you had a well coordinated command structure leading a peoples army so dedicated to its cause that it bordered on religious devotion. To make matters worse, the true believers held the tactical high-ground in the upcoming epic battle. The French on the other hand were fractured in their support for the mission, its objectives and its planning were called into question, with many of the ground commanders less than gung-ho. This lack of fervor on behalf of the officers threatened to spill over on to the troops. But men like Gilles, and Cogny, and Bigeard were above all else good soldiers. They knew the army wasn’t run on consensus. For most, it was not the first time they had to carry out an unpopular command decision. They would not shy away from a fight. In their minds, they would win with a combination of firepower and esprit de corps. Aerial resupply worked pretty well early on despite all kinds of unexpected problems. Simply keeping the garrison fed was a major issue, with the dietary requirements of disparate peoples complicating matters greatly. Muslim troops would not eat pork, Vietnamese troops required fish sauce, the French soldiers demanded cheese and wine rations. Equally important was the resupply of fuel and ammunition, the two crucial material factors in battle. This all was difficult enough when the airstrip was functioning. It became next to impossible as time wore on, especially after the airstrip was closed by Vietminh artillery. After that the French were totally dependent on parachute drops for reinforcements and supplies. Just to add insult to injury, it was soon apparent that the Communists had anti-aircraft artillery, some thirty-six 37mm guns, surrounding the French position. That was a surprise. It forced the pilots to make their drops from increasingly higher altitudes, reducing accuracy. That resulted in the loss of significant amounts of ammunition and supplies to the Vietminh. French-trained tribal guerrillas had a significant role in French plans. The idea was that they could tie down significant numbers of Vietminh, and that was the case. Unfortunately, the Vietminh had other ideas. Giap struck at their main base at Lai Chau in the fall of 1953. Navarre determined that the T’ai guerilla base and capita of Lai Chau couldn’t be defended. Navarre ordered the King, along with women and children and French support personnel, evacuated by air. The remaining fighting men were to attempt to break out and head south. It was a blood bath. They were subjected to constant ambushes from the moment they left the encampment. Only about ten percent lived to tell about it. The battered remnant that reached Dien Bien Phu wasn’t much help to the French. The artillerymen at Dien Bien Phu were a mix of black Africans and Moroccans. The most important French artillery piece was the US 105mm howitzer, the standard US field piece of World War II and Korea. In addition to the 105mm howitzer, the French had smaller numbers of US made 155mm howitzers and 155mm guns. The Peoples Army of Vietnam (PAVN), as the Vietminh army came to be known, was a structured, well-organized force. The command structure was definitely top-down, but there was much less emphasis on rank and differences between the men than you typically see in a western army. At the top were the dedicated communist political cadres and the military generals. The army itself was broken into three primary parts: the regular troops (known as Main Force troops); next were regional force guerrillas; and finally the smallest component parts were the local guerrillas. The basic organizational building block at the bottom of all Vietminh units was the three man cell. This cell structure, the theory goes, mitigates against the tendency towards individualism. Two comrades might get together and decide to disobey orders, or worse, desert, but the third man was harder to convince. Add to that the known existence of spies within the ranks and it was a brave soul who dared foment dissent. The practice was patterned after Mao’s Chinese Peoples Army and was shown to be quite effective. The regular PAVN infantry regiments and divisions were primarily light infantry. That is, they were armed with rifles, submachine guns and light machine guns. Their supporting weapons included heavy machine guns (heavy meaning 12.7mm), mortars and recoilless rifles. They were tightly disciplined both militarily and politically. Their fire discipline and camouflage discipline were superb. They were masters of the ambush. Given time to closely plan an assault, they were among the best infantry in the world. They could sustain remarkably heavy casualties in an assault and keep coming. And when they weren’t drilling on the field they were listening to political commissars who kept a close watch over morale and political indoctrination. In 1953-54 the French still had a significant advantage in firepower, especially artillery. The most important gun on boths sides at Dien Bien Phu was the US 105mm howitzer, the standard US field piece of World War II and Korea. In addition, the French had a few 155mm howitzers and both sides used heavy 120mm mortars. The French had received theirs directly from Uncle Sam. The Vietminh got theirs from the Chinese Communists, who had taken them on the battlefields of China and Korea. The Vietminh understood clearly that they couldn’t fire artillery from open battery pits because the French had more accurate artillery and control of the air. Once spotted from air it was usually only a matter of minutes before the gun was targeted by artillery or napalm. So the Vietminh rarely if ever used open gun pits. Instead they learned to dig guns into bunkers and caves on the sides of the jungle covered mountains looking down on the French positions. The French couldn’t see them, let alone hit them. The downside was that once the guns were dug in, they couldn’t be moved or re-sighted without immense labor. The 1952-53 Winter-Spring Campaign was the first time that the Vietminh had launched large-scale offensive operations in the highland jungles of North Vietnam. The attacks ultimately bogged down, but Giap and his staff learned much from them. First and foremost, they learned that they could not depend on the hill tribes for logistical support. In fact, the hill tribes were mostly hostile. In response, they recruited ethnic Vietnamese as porters, including the mobilization of thousands of women into a support apparatus that came to be called the “long-haired army.” They had learned to stockpile supplies and how to store them in hidden locations along strategic routes. The Vietminh at Dien Bien Phu were supplied by these coolies and long hairs pushing bicycles loaded with sacks carrying hundreds of pounds of rice and supplies. Also, heavy duty support in terms of ammunition, gasoline, and so on came by truck along the so-called Chinese Road, actually a whole network of roads running from the Chinese border to the base areas in the Viet Bac and on down to the Dien Bien Phu Basin. The bulk of the rice came from the Than Hoa area and it was carried by bicycle. Finally, these porters helped Giap’s army attain near super-human feats by pulling tons of artillery up steep, sometimes muddy, mountain slopes to be fixed in caves on the crests above the fog-shrouded valley. Perhaps the most enduring achievement of the Vietminh surprise at Dien Bien Phu was this amazing feat of overcoming logistical obstacles. What Giap and his forces accomplished there was nothing short of miraculous. For all the Vietminh success in the 1952-53 Winter-Spring offensive, the French still didn’t buy the possibility that Giap could supply his army and provide it with significant artillery support such a long distance from his bases. Once again, the French underestimated the determination of the Communists and overestimated their own ability to deal with them. Morale was also a pivotal factor. Any time a battle comes down to attrition, to whoever will stand the longest and throw the last punch, that places a premium on troop morale. At Dien Bien Phu the continual artillery fire was important. The French had relied on having artillery superiority but they could never silence the Vietminh artillery. In consequence, the French casualties built up, drip-drip-drip, and morale ebbed away. As the weather turned worse French prospects turned gloomier by the day. The Vietminh had learned by then to deal with great loss. In the Winter-Spring Offensive alone they had suffered heavy casualties in their elite combat divisions. Some units lost over 50% of their ranks. The airstrip was the prize that made Dien Bien Phu valuable territory for the French. It was located on the largest tract of reasonably dry ground in the valley and was dominated by rising ground to the north. The position was also crossed by the Nam Yum River, which ran north to south through the French redoubt. There, in the valley of the Nam Yum, the French erected a series of strongpoints in an attempt to form an integrated defensive system. Most of the strong points were built on a series of hills. That was good in principle, unfortunately for the defenders, they did not appreciate the need for artillery-resistant log-reinforced bunker fortifications until it was too late. As a result, Vietminh artillery was far more effective against the French positions than it would otherwise have been. The design of the French position was based on strong fire support from several interior strongpoints augmented by artillery from an outlying strongpoint, Isabella, located to the south, presumably well out of range of Vietminh guns in the mountains to the north. The Isabella defenders were also charged with preventing the Vietminh from encircling, and over-running, the central position. Other outlying strongpoints, Anne-Marie, Gabrielle and Beatrice, were intended to keep the Vietminh at a distance, well out of mortar range of the central position and the air strip. They were north of the main position, the direction from which the Vietminh were expected to approach. Beatrice was held by a Foreign Legion infantry battalion and Gabrielle by a first-rate Algerian battalion. Inexplicably, Anne-Marie was garrisoned by T’ai partisans, survivors of the trek from Lai Chau. The airstrip, dilapidated early on, had been rebuilt using pierced steel planking (PSP), interlocking perforated plates of steel. This design was advantageous for several reasons, it was quickly assembled and easily repaired and it was mobile. The main logisctical dumps were at the south end of the strip not far from the main headquarters bunker and a make-shift water purification plant. The highest terrain in the central position was on the terrain just east of Eliane and Dominique. The strongpoints were usually partitioned into a series sub-strongpoints based on terrain. The importance of strongpoints Éliane and Dominique was critical. 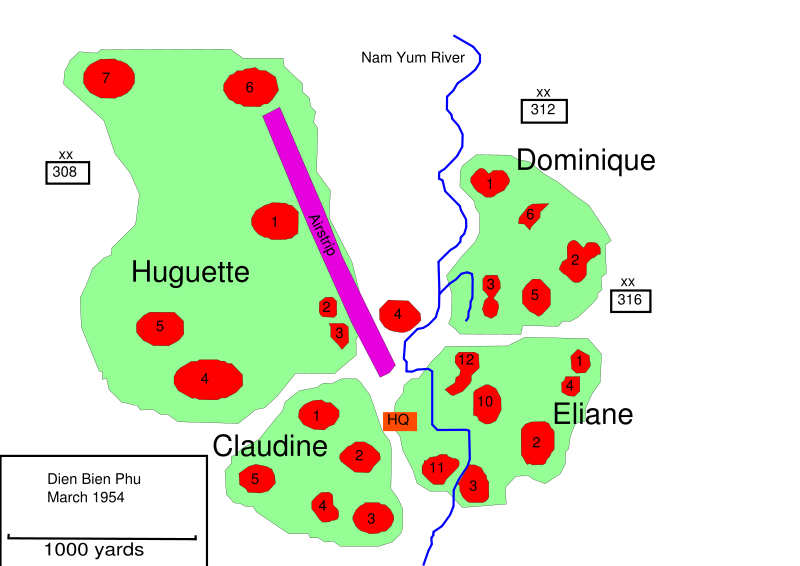 Dominique 2, Élaine 1 and 2, and to a lesser extent Éliane 4, were higher than the terrain around them and thus dominated the central position. So long as the French held them they felt that they could turn back any Vietminh assaults. Soon November passed. The French, still hard at work rebuilding the airstrip and digging into the strongpoints, began sending patrols to investigate the surrounding mountains, jungles and fields. Over time they encountered steadily increasing resistance. In mid-December a reinforced Moroccan battalion, led by Lt Col Langlais, was sent towards Dien Bien Phu from central Laos. De Castries then dispatched the 1st Foreign Legion Parachute Battalion from Dien Bien Phu to link up with them. Two days before Christmas, 1953, they met at a place called Sop Nao. De Castries flew in by light aircraft and news media representatives were flown in to record the event. Some of the more perceptive reporters noticed that the French troops looked pretty bad. In fact, they were in sorry shape because the march had been exceptionally arduous and they had been harassed by tough Vietminh guerrillas all along the way. As you might imagine, that little bit of information went unstated by de Castries to the press. De Castries then jumped back in his plane and flew back to his post. Langlais and his troops on the other hand were left to march back. On the return to Dien Bien Phu Langlais ordered his men to leave the main trail and cancelled all air supplies for fear of giving away his position to ambushers. They made it, but they were exhausted. By January the Vietminh were beginning to shoot and hit the airstrip on occasion. They had by then deployed the first artillery pieces they had managed to haul up the slopes. The French couldn’t find them. Then, on January 31, in honor of Têt, Vietminh batteries opened fire from camouflaged positions two and a half miles north of the main French position. The barrage lasted for about thirty minutes. Fighter planes took off from the airstrip and circled overhead, but the French never found the guns. It was a warning. Throughout February and on into March French patrols continued to sally forth into the surrounding countryside, and they continued to encounter stiffening opposition. Slowly French intelligence came to realize that the Vietminh were there, that they had occupied the surrounding mountains in strength, and they appeared to be defying all logistical odds. This must have been a terrifying process of realization for the defenders at Dien Bien Phu. The Romans must have felt similar distress upon seeing Hannibal’s legions descend from the Alps atop elephants. Unfortunately for the French there was no Scipio to save them. By March 13, 1954, the Vietminh had carefully worked their way forward, digging in their artillery and antiaircraft guns right under the noses of the the French. Giap’s preparations were complete; his divisions were in position and his supply dumps full. Strongpoint Beatrice was scheduled to take the brunt of the first attack and as such its capture was the first objective. The initial attack was planned for dusk. All variables were accounted for, right down to the smallest details. For example the date and time were carefully chosen based on the phase of the moon: on March 13 at dusk, weather permitting, the heavenly object would produce just enough moonlight for the Vietminh sappers to feel their way through the French wire, but not enough for the French machine gunners to see them. But sometimes even the best laid plans are subject to the whims of fate. At Dien Bien Phu the battle actually began by accident at about noon when French defenders on Beatrice spotted approach trenches and dispatched a patrol to investigate. That in turn, triggered a Vietminh artillery response. The artillery barrage went on unabated for several hours. It was the beginning of a long and painful siege, one that would alter the course of twentieth century history dramatically. The main artillery concentrations were against Beatrice, particularly the forward bunkers and wire. Strongpoint Gabrielle, where Leiutenant Colonel Jules Gaucher was in command of the northern sector, also endured a major attack that first day. By early evening, masses of Vietminh infantry rolled down out of the hills and launched human wave attacks against Beatrice. In the midst of the attack the command bunker took a direct hit, killing the commander and his entire staff. At the same time, strongpoint Gabrielle was also being hit by infantry attacks that temporarily overran some forward positions. Battalion Commander Lt Col Gaucher and his staff were so occupied with their own defense that they lost track of their mission to support Beatrice. At that moment the two forward-most strongpoints, painstakingly designed to be mutually supporting, were severed, each fighting alone desperately to survive. Then things went from bad to worse; just as it seemed that Lt Col Gaucher was getting a handle on the situation, a shell penetrated the vent shaft of his bunker and killed him. To make matters even worse, his radios were knocked out of action with him. At that point both Beatrice and Gabrielle were leaderless and disconnected. Gaucher’s carefully planned orders to provide 120mm mortar concentrations to support strongpoint Beatrice were never carried out. De Castries was shocked and left reeling by the breathtaking turn of events. He then ordered Langlais to take over from the fallen Gaucher on Gabrielle. Langlais was to make his way to the strongpoint and secure it. From there he would assume tactical control of the entire defense of Dien Bien Phu. Langlais immediately bolted into action. He made it to Gabrielle to find Gaucher’s command structure beyond saving. Determining there was little he could do under the existing circumstance, Langlais chose to make a mad dash back to the headquarters. He made it, but the reeling soldiers on strongpoint Gabrielle were left to fend for themselves. Langlais would not relinquish control of Dien Bien Phu’s defenses for the duration of the battle. Within a matter of hours the world of the French defenders at Dien Bien Phu had been turned upside down. They had lost two battalion commanders and their two outermost defense fortifications were in danger of being overrun on the first day of the battle. To complicate things, the Vietminh artillery seemed to be unreachable, dug into the back sides of the mountains overlooking the valley with only the muzzles showing. The French artillery observers could see the muzzle flashes at night and plot them, but silencing the guns required a direct hit in the firing slot, something that was highly unlikely. There is no evidence that the French ever silenced a single bunkered artillery piece dug in for direct fire. All afternoon and into the evening, Lt Col Piroth had wandered the central position in shocked resignation. Events had shown that he had failed in his duties as artillery commander for the base. He had failed to anticipate this eventuality. Now his overconfident boasts to visiting dignitaries rang hollow, drowned out by the sound of the dominant Vietminh artillery. All he could do was wander in a daze, apologizing for the failure of his counter-battery program. Then, in the early morning hours of March 14, the second day of battle, alone in his room, Piroth committed suicide by holding a grenade to his body. De Castries reported to the troops that Piroth was killed by a Vietminh shell that had buried him in the bunker where he died. There was heavy fighting on Beatrice with heavy casualties on both sides. When dawn broke Beatrice and an entire battalion of the Legion were gone. Perhaps a hundred demoralized survivors had exfiltrated and made their way to the central position. It was an important Vietminh victory on several levels, maybe most importantly because it taught the Vietminh infantryman that his side might actually prevail. The next morning the Vietminh declared a brief truce so the French could recover their wounded. The French soldiers must have been severely demoralized when they saw the smoking ruins of Beatrice. Later that day, at de Castries’ request the French dropped in reinforcements, the 5th BPVN, Bataillon des Parachutistes Vietnamiens, Vietnamese Parachute Battalion. They drifted down on top of the central position shortly after noon. As the sun rose over the valley on the second day of battle the Vietminh had clearly gained the upper hand. They had delivered the first blow. Beatrice had fallen. Vietminh guns were in unreachable bunkers, they could target French positions with artillery at will. The airfield was firmly in the cross-hairs. Vietminh guns had it under fire, rendering it unusable for all practical purposes (some daring reinforcement and evacuation flights did continue for a time but those also ceased in the end). And suddenly, without warning, this: the Vietminh had deployed a series of Soviet M-1939 37mm anti-aircraft guns in the mountains. The presence of anti-aircraft artillery was a real shock to the French. Next, Giap set his sights on toppling the stricken Gabrielle strongpoint. He would send his forces to overwhelm the hapless survivors. But Gabrielle proved to be a tough go. Much tougher than Bearice as it turned out. Why? On the hill on which Gabrielle was located there was a small forest of hardwood trees. Gabrielle was garrisoned by the 5ème Bataillon/7ème Régiment de Tirallieurs Algériens, 5/7 RTA for short, the 5th Battalion/7th Algerian Rifle Regiment, under a competent, hard-driving commander, Major Roland de Mecquenem. The regiment had a long and distinguished record of service in Indochina and a significant number of the NCOs had served in Italy during World War II. They realized the wood could be essential to their fortunes early on. They built a comprehensive defense system, based on log-reinforced bunkers connected by communications trenches. Their efforts made Gabrielle the only adequately fortified French strongpoint at Dien Bien Phu at the onset of battle. In addition to having competently constructed bunkers, it was the only strongpoint with more than one interior line of defense. The communist artillery opened up as dark fell, shortly followed by mass infantry assaults, throwing two entire regiments of the 308th Division against the position. Major de Mecquenem’s bunker received a direct hit early in the fight; he and his entire staff were killed. Under the command of their NCOs, the Algerians put up a stout defense, inflicting huge casualties on the Vietminh assault columns, but the Vietminh persisted. By the early morning hours of the next day, the situation was increasingly dire. At that moment, Colonel de Castries ordered Langlais to relieve the position. In organizing his relief column Langlais made a crucial error. Perhaps to conserve his Foreign Legion battalions and French parachute battalions, he decided to use the 5th BPVN for the counterattack force. But they had just dropped into the position a few short hours earlier. Even an unopposed parachute drop exacts its toll in fatigue, this one was particularly rough because the Vietnamese paras were dropped from only 600 feet to avoid Vietminh fire. Those Vietnamese paras were tired. More important, they were new to the scene and unfamiliar with the battlefield, and they were untrained in guerrilla warfare. Nonetheless, the 5th BPVN, reinforced by several tanks and a company of the 1st Foreign Legion Parachute Battalion, headed off for Gabrielle before daybreak. Two hours later, at a ford on the last stream before Gabrielle, the relief column ran into an ambush. The tanks and Legionnaires attacked directly into the ambush and eventually overran it. But the Vietnamese paratroops froze in their tracks and took heavy casualties. Langlais had to abandon his plan to reinforce the Algerians and instead ordered Gabrielle abandoned. The Algerian defenders were by then a spent force. They fled and would not contribute much the rest of the way. The following day, the T’ai soldiers defending Anne-Marie, under a relentless barrage of propaganda from Vietminh bullhorns, began to melt away, fading off into the jungle, hoping to return to their wives and families. In what would turn out to be a disastrous decision, de Castries ordered the position abandoned, opening the entire area between Anne-Marie and the central position to the Vietminh. Reinforcements and supplies would henceforth come in only by parachute, and the DZ (drop zone) they would have to hit had been reduced in size significantly. From then on supply drops ended up more and more in enemy hands. The evidence strongly suggests that the enormous infantry losses endured in taking Beatrice and, particularly, Gabrielle, and the unexpectedly high expenditure of artillery forced Giap to make fundamental changes in his plans. Unable to sustain their human wave attacks, Giap’s Vietminh commanders reverted to eighteenth century siege tactics, digging their way closer and closer to the French position. During the lull that followed the fall of Anne-Marie, certain French officers took stock of the situation, notably Lt Col Langlais and his fellow paras. They perceived that they had been badly let down by de Castries’ staff, if not Castries himself, and at some point on the afternoon of the 24th, led by Langlais, they marched into de Castries headquarters. Precisely what happened next is subject to debate. Bernard Fall describes Langlais removing de Castries from command at gunpoint and replacing him as commander. British historian Martin Windrow provides a less treasonous account; he portrays the negotiations more along the lines of a gentlemens’ agreement, with de Castries willingly retreating into the inner sanctum of his bunker for the duration, leaving Langlais in charge. The truth, as usual, probably lies somewhere in between. Whatever the case may be, from that point on Langlais was calling the operational shots at Dien Bien Phu. De Castries remained nominally in command and continued to serve as a link to higher headquarters, but henceforth it was Langlai and his “Paratroop Mafia” that made all tactical decisions. De Castries rarely left his bunker for the remainder of the battle, but took responsibility for major decisions and remained on good terms. By March 24, the battle was already taking on the look of a long test of attrition. Remember that most of the T’ai soldiers had deserted on Anne-Marie. Now, as the siege lengthened, morale in the North African units began to waiver, producing widespread desertions. Soldiers deserted their units in groups and took refuge in dugouts they made along the Nam Yum River. The French referred to them as the “Rats of the Nam Yum.” The Foreign Legion, the paratroopers, and certain Moroccan units retained their cohesiveness to the end, but there was a tremendous amount of internal desertion elsewhere, particularly among the colonial troops. The battle wasn’t all one-sided. The French had their share of surprises in store for their adversaries. The first came in the form of a counter-attack on March 28th. The order, given by Lt. Col. Pierre Langlais, was to destroy the communist anti-aircraft machine gun and light anti-aircraft artillery positions that were hounding aerial resupply efforts. Langlais turned to Major Marcel Bigeard, the commander of 6th BPC, to lead the effort. Bigeard accepted the challenge, but not before giving the realistic assessment that Langlais must be willing to accept significant losses among his best units, the Foreign Legion infantry and parachute battalions. Langlais said he was and ordered Bigeard to organize and command the action, giving him full authority over everything and everyone. Bigeard went to work. Working tirelessly throughout the night he quickly, by himself, developed a plan of attack that would be supported with sophisticated artillery support. Bigeard consulted with his officers, the boots were organized, and the force set off on the 28th. The French attack caught the Vietminh completely by surprise and inflicted significant loss. The success however was dampened by significant French casualties. Some of the very best French stock had perished, including a disproportionate number of junior officers, absolutely vital to unit effectiveness. The gains were transient since the French lacked the manpower to hold the ground they had taken. Bigeard led his men back to the base. Effective French counter-attacks were to prolong the battle by preventing the loss of key positions for a time, but their main impact was on morale. When well planned and well led, they inflicted heavy loss on the Vietminh right up to the bitter end. But the numbers once again were not in favor of the French. For they too sustained significant casualties among elite units, casualties which, unlike Vietminh casualties, were not replaceable. The aftermath of the 28 March counterattack set the stage for the final struggle. The Vietminh had around twenty-five 105mm howitzers and twenty 75mm howitzers, all in well-camouflaged individual gun positions on forward slopes. The French started the battle with twenty-four 105mm howitzers and four 155mm howitzers, all in open gun pits and exposed to communist artillery fire. After the loss of Beatrice, Gabrielle and Anne-Marie, the critical central position was tactically dominated by the high ground to the east of the Nam Yum River. The upshot: the contests for Éliane, Dominique and Huguette would be particularly bitter. The loss of Éliane 2 would ultimately seal the fate of the French at Dien Bien Phu. Both sides recognized this. Now the digging intensified in front of the French wires, with the Vietminh trenches drawing ever closer. The French mortars gave them a terrible pounding but the Viet’s seemed unfazed, they just kept coming. Langlais surveyed his defenses and decided, just in time, to reinforce the key strongpoints at Dominique and Éliane. Once again he called on Bigeard. Bigeard had planned and orchestrated the 28 March conterattack with distinction and now Langlais put him in charge of front line operatons with full authority to call in artillery and order counterattacks. Bigeard, always unarmed, posted himself in a dugout on the forward slopes of Dominique 5 with a battery of radios and waited. Shortly after nightfall on the 30th, the Vietminh launched a massive attack on Dominique and Éliane. Their trenches had indeed encroached perilously close to the French positions, with some advance units jumping off from trenches within a hundred yards or less of the French wire. They were covered by a heavy bombardment of the French front lines orchestrated by Vietminh guns high above. Vietminh infantry almost immediately overran Dominique 1, 2, and 6, Éliane 1, and most of Éliane 2. With the situation deteriorating fast all around them, the Algerians defenders on Dominique broke and ran, streaming to the rear. The situation was saved by a battery of 105mm howitzers, black Senegalese gunners who dropped their guns to zero elevation, cut the fuzes to zero delay, so that the shells would explode as soon as they cleared the muzzles, and opened up when the charging Vietminh were almost on top of them and shredded the better part of two regiments. Had they not done so, the Vietminh would surely have broken into the central French position with disasterous consequences for the French. Survivors from the ranks of the shattered Vietminh attackers scrambled in disorder. Some tried to take cover in the area between Dominique 1 and 2, where the French had laid a minefield. Losses to mines were horrible. The Vietminh thrust was stopped with Dominique 3 and 5 still in French hands. For the French commanders a major crisis was at hand. Sometime prior to midnight Cogny, having heard gloomy reports from Castries’ headquarters—that most of Dominique was in communist hands and it looked as if all of Éliane would shortly follow—left his headquarters, presumably for his quarters. Meanwhile, in Saigon, Navarre was listening in on the command and control net. He heard the reports from Dien Bien Phu and immediately ordered his personal C-47 to take him to Hanoi to Cogny’s headquarters to consult with his top commander. Navarre, who had sent advance notice of his pending arrival to Cogny’s headquarters, landed at Gia Lam airport around midnight and was met by a relatively junior staff officer. That was a serious breach of military protocol. Where was Cogny? Navarre proceeded to Cogny’s headquarters. A telephone call to his living quarters was fielded by one of Cogny’s aides who insisted he had orders from Cogny not to be disturbed. That was the last straw. Navarre went on the warpath. Not only had his theater commander committed a major breach of protocol by not meeting him at the airport, but he had also deserted his post in dire times. Something had to be done about it. So Navarre took direct command of Cogny’s headquarters right then and there. Another call to his Cogny’s at 2am produced nothing. Finalyy, in the morning, at seven, Cogny turned up and discovered that his boss had arrived in his absence and taken over. Flustered, Cogny began briefing Navarre on the tactical situation and it was clear that he had no idea of the current situation. Navarre exploded and proceed to publicly upbraid Cogny. Whatever bonds of trust and mutual respect that may have existed between the two men snapped. While all of this was taking place, back at Dien Bien Phu, the French, or at least Bigeard and some of the junior leaders, had learned the value of immediate counterattacks. On Éliane 2, a mixed force of Moroccans and paras reacted accordingly, without orders from above. Shortly after midnight they had retaken half of the position. By daylight the situation had stabilized. The Vietminh had gained important ground but the attack wasn’t decisive. Casualties on both sides were piling-up. French counterattacks could push the Vietminh back, but the French were running out of Legionnaires and paras willing to mount counterattacks. The enemy continued to put the pressure on; Giap kept throwing his men into attack after attack. But the Viets were also clearly hurting. On April 4th, the Vietminh abandoned ground dearly paid-for at Éliane 2. They had to have had a good reason. After all, that move temporarily put new wind in the French sails. A plausible explanation is that they were running out of well trained troops. On 5 April, after almost a week of constant attacks, the scale of the Vietminh attacks suddenly slacked off a bit. At the time, the French intercepted Vietminh signals calling for more supplies and more reinforcements. Giap knew he had time on his side. The noose around the French was tightening, and the 37mm anti-aircraft guns were forcing the French transport to fly at increasingly higher altitudes with a corresponding loss in accuracy. They were resupplying the Vietminh as well as the French, particularly in one critical commodity: artillery ammunition. Even under such conditions French counterattacks continued to be effective. The high-point, indeed the last real victory for the French at Dein Bien Phu, was a brilliantly-planned night strike on April 10 that retook Éliane 1, driving off Vietminh troops while visiting heavy losses upon them. The French re-capture of Éliane 1 was an important moment in this phase of the battle. It seems to have had a serious adverse affect on Vietminh troop morale, leading to the appearance of “rightist and negative” tendencies (the quote is from Giap). Bernard Fall believes that the Vietminh morale collapsed and was restored only by heroic efforts on the part of the political commissars. Giap, in his memoirs, considered it one of his greatest achievements that the troops continued the battle through all this. There was a pause and a hint of hope for the French, but Vietnminh reinforcements arrived, the noose continued to tighten and the French counterattacks started to fade. Interestingly, the French had no difficulty finding volunteers to jump into Dien Bien Phu. Many replacements made their first and only parachute jump going into Dien Bien Phu– when it was increasingly clear that the place was doomed. They included nearly three hundred Vietnamese. Many would never see their homes or families again. Between the 10th of April and the 6th of May the pace of events slowed even more. The Vietminh did finally overrun strongpoing Huguette and the airstrip, reducing the DZ to essentially the central position and nothing more. More and more essential parachuted supplies fell into communist hands. But it does seem that the Vietminh may have run short of artillery ammunition. It would explain why, after early April, they never again mounted a serious attempt to neutralize the French artillery. Meanwhile, the monsoon rains had started on the 30th of March, slowly putting much of the position under water. It was really a mess, but the French were still holding on. By then the place was truly the “hell in a very small place” that Bernard Fall famously called it. The hospital was a place of extreme terror, with bodies, living and dead, strewn in any available place waiting for care, many with missing or gangrened limbs. Maggots were ubiquitous. There was not enough morphine. Outside more bodies lay in the mud, sometimes trampled under the feet of active troops racing through the post to sure up defenses. Piled up in the defensive wires and along the French perimeters were mounds of decomposing Vietminh corpses. Some French soldiers piled the bodies like sandbags in front of their firing positions to stop oncoming bullets. There were men everywhere suffering from shell shock, some still deployed forward and fighting in foxholes. The thousand-yard stare was no longer the exception but instead it was the rule. With the continual drizzle and fog that hung over the valley the scene was not far removed from a Bruegel landscape. The monsoon also made the flying weather worse, with direct adverse effects on supply drops and ground support sorties. Particularly after the loss of Huguette, the drop zone was so small that most of the 105mm ammunition went to the Vietminh. We know that it did because the Vietminh artillery began firing rounds with advanced American time-delay and VT fuzes with devastating effect (VT shells had a tiny battery-powered radar transmitter and receiver activated by the force of firing. The radar transmitted until it picked up a return, then detonated the shell at the optimum height above the ground, producing a lethal hail of shrapnel). The Vietminh got stronger as the French got weaker. By the 5th of May the fortress was down to virtually nothing. But Giap’s troops weren’t exactly swimming in supplies. The Geneva Conference was about to convene. Something big had to happen, soon. Ho Chi Minh directed Giap to launch a final assault. He did so. The assault forces rose up out of their trenches and streamed forward beginning just after dusk on 5 May. The French guns smashed the first wave, literally obliterating the attacking infantry, wiping out an entire regiment. But Giap had a backup plan. Like something out of World War I the Vietminh had been tunneling under strongpoint Éliane 2 for weeks. The French on Éliane could hear them, constantly, digging beneath them day and night. But they could do nothing to stop it. Now it was time to harvest the fruits of those labors. In the heat of the battle Giap ordered the detonation of a ton and a half of TNT underneath Éliane 2, removing it from the map. Only a large gaping hole remained. The few surviving French on Éliane 2 were stunned, but still managed to mount some resistance, but the French were out of men and ammunition. It was over. Langlais, Bigeard and the rest of the French commanders exchanged farewells on the tactical net and started destroying their equipment. Several breakouts were attempted, with little success. The next afternoon it was all over; Vietminh assault troops overran the central strongpoints, capturing the command headquarters. They made their way into de Castries command post and found him sitting behind his desk, dressed in his best uniform. The French high command maintained that there was never a surrender, but that’s an academic distinction. Game over. Near the end, when Dien Bien Phu was surrounded and slowly bleeding to death, it was a major global news event. People from all over the world followed the course of events in their daily newspapers and on movie newsreels. There was a serious hope by the French and anti-communists everywhere that the Americans would ultimately intervene on behalf of the besieged heroes and save the day. There was considerable debate in the highest echelons of the U.S. Government about committing B-29s to bomb the Vietminh positions in the mountains surrounding Dien Bien Phu. American Joint Chief, Admiral Arthur Radford, had an operational plan called Operation Vulture to do just that. He reportedly urged President Eisenhower to let him carry it out. There have even been claims that Radford discussed the possible use of tactical nuclear weapons with the French. In the end, Eisenhower decided to pull the plug on the French. No B-29s to the rescue at the last minute. He requested Congressional input on the matter and among those who advised against using American air power to bail out the French was Senator Lyndon Johnson, But it may have been the forceful stance taken by former Korean War commander Mathew Ridgway that resonated most with Ike. Ridgway warned against ever again becoming involved in a jungle war on the Asian mainland. He saw American intervention leading to an impossible quagmire in the making. Vice President Richard Nixon on the other hand warned that if we didn’t win Vietnam right then we would have to win it later at much greater cost in national blood and treasure. Eisenhower overruled him. So U.S. air power was not used. Fascinating to think about with the benefit of hind-sight. Finally, a word about the French prisoners of war, POWs. After the final collapse at Dien Bien Phu a truce was signed allowing the French to fly out some of their wounded. The Communists added their usual surreal twist to the proceedings; a Soviet movie director was on hand to shoot a propaganda film. He began filming shortly after the firing stopped. After filming a re-creation of the storming of the central strongpoint he lined the prisoners up for what looked like an endless column of men snaking around a dry riverbed. It’s a famous shot. Then the men were marched off into captivity. In some cases they had to march as much as three hundred miles. The death rate was horrendous, men dropped dead all along the road, on the order of sixty percent. It had to have been a terrible ordeal. For a splendid depiction of the events described here I recommend reading The Centurions by Jean Larteguy. When the prisoners were finally repatriated, in August through October of 1954, they were in terrible shape. Almost no French prisoners with an open wound or, head, chest or stomach wound survived Vietminh captivity. After Dien Bien Phu, the French were in a weak diplomatic position, because they were in a bad military position. Immediately after Dien Bien Phu fell, the Vietminh began moving their divisions back to the Red River Delta, began reinforcing their guerillas inside the Delta and by July were giving the French fits. The French essentially lost control of most of the Delta, certainly at night. The war wasn’t over, in fact a big battle in the Central Highlands was yet to happen, but the French had lost all leverage that might have been used to hold onto, say, Cochinchina (South Vietnam). To end, Dien Bien Phu was unquestionably an important event in world history. In a sense it was the last stand of colonialism in the Far East. The Brits had fled India and were in the midst of the Malayan Emergency. The Dutch war of reconquest in Indonesia had been futile. By contrast, the French fought long, hard, and at times effectively, for French Indochina. Dien Bien Phu was the decisive battle. It had a profound effect on the second half of the twentieth century. One final confrontation between the French and Vietminh took place after the fall of Dien Bien Phu—a good bit of of Bernard Fall’s Street Without Joy is devoted to it—it involves the Foreign Legion battalion that fought alongside the US forces in Korea. If you’ve seen the opening scene of the movie We Were Soldiers Once, these are the troops depicted. Ironically this last battle of the first Indochina War took place near the exact spot where the first Battle of the Second Indochina War would take place 11 years later in the Ia Drang Valley.